Sonia Camacho is a Berlin-based illustrator and artist born in Seville, Spain, who currently develops illustration and design projects in Europe. Sonia experiments with illustration techniques based on the execution of simple yet powerful portraits. Her fine art and commercial portfolios are available online. She provided art for this week's story, "Gracia" by Susana Vallejo. Sonia Camacho: I studied communication science, but I was always involved in the art scene. These two disciplines allow my illustrations to speak for themselves. Tory Hoke: Tell me about your striking "On Red" portraits, including "La Pena." 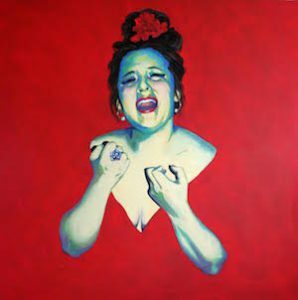 Sonia Camacho: "La Pena" is the latest canvas in the series "On Red," which represents a visual metaphor of a flamenco soleá. This type of flamenco is characterized by stories of passion, with drama and sometimes even tragic endings. In this regard, the four canvases represent love, passion, jealousy, and tragedy—in this order. © 2015 Sonia Camacho, "La Pena"
Tory Hoke: What inspired these? How would you describe your use of color to capture emotion? Sonia Camacho: The red color is the fifth protagonist of this series of four canvases—the connector if you wish. In short, the color red is the narrator of this story of passion and sorrow. Tory Hoke: Your work has taken you from Seville, Spain, to Berlin, as well as a visit to China, where you illustrated your own memento postcards. How do your travels influence your work? Where would you like to go next? Sonia Camacho: My travels have had a strong influence in my work, but even more influential have been the people around me, both here in Berlin and on the road. Having said that, it doesn't matter how many trips you make; what really influences the work you produce is finding oneself. Sonia Camacho: Currently I live in Berlin. This is a city that breathes art wherever you go. Everyone here has some connection with art in one form or shape. However, during my time in Seville, I was also very involved with the local art scene. Sonia Camacho: There are currently a stream of illustrators I like to follow in Spain, but artists like Modigliani and Mondrian were a starting point for me, as far as inspiration is concerned. Sonia Camacho: Illustrations that narrate the content and not the continent in order to imagine oneself beyond. Sonia Camacho: One that will endure with time in analog memory. 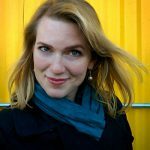 Sonia Camacho: I just gave birth to a beautiful baby girl, so I thought it was time to combine both my passions in a single project: writing and illustrating a classic children's book. Set in a fantasy world, the story will send a very modern message, while the lessons learned by the young readers and their parents will be real.